Winter is not yet here but already there are some nasty cold and flu bugs moving through my kids’ school. 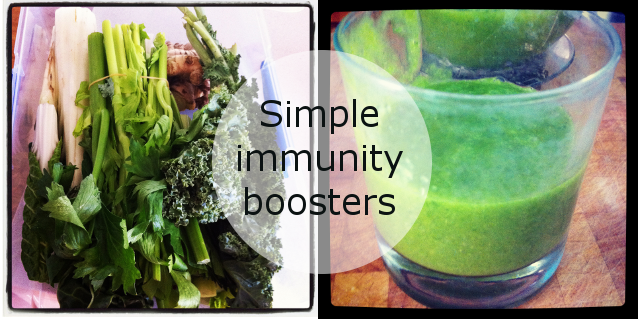 It’s a timely reminder to start focusing on boosting immune systems here. I expect my kids to pick up a sniffle of some description every year – it’s a part of nature to build immunity this way. Our bodies are equipped with the most marvellous defence system that will stand up and fight at the sign of invasion, and forever protect you against that intruder should it show up again another time. Still, no mum likes to see their kids sick, and none of us like to be infected by our little cherubs either. Mums just don’t have the time to be sick, as we all know. Our immune system will put up a far more effective fight against viruses if we get out of it’s way and keep it strong in the first place. I have noticed that as a family we don’t pick up anywhere near as many colds and illness bugs as we used to. Aside from a healthier diet, the single biggest factor I think that has largely contributed to this has been being chemical free. I rid the house of ‘chemical cleaners’ (such an oxymoron, ‘chemical cleaner’!) years ago, and think it is the easiest, fastest and cheapest way anyone can improve their health instantly. But I’ll save that post for another day. Giving your immune system a boost isn’t as complicated or as expensive as advertised products would have us believe. You don’t need to guzzle a small fortune in supplements or vitamins. Yes, there are some products and ingredients you can use for extra oomph, but none of them are worth the price if you compromise yourself in other areas, like the ones listed below. Get enough sleep. You can probably relate to how you feel when you’re sleep deprived – you start to feel rundown. And when you’re rundown, you get sick. Sleep deprivation compromises your immune system. Sleep is so vital to repair functions and also fighting inflammation, which is a precursor to disease. Adults need around 7-8 hours, teens around 9-10 hours, and kiddies up to 10 hours a night (my two do about nine). Cut caffeine. Sorry, but too much of the stuff adds pressure to your adrenal system, which puts pressure on the rest of your body, including immunity. It will also disrupt your sleep, so double whammy. Don’t eat sugar. Refined, processed sugar suppresses your bacteria-fighting system. Part of your immune system is the healthy bacteria in your gut, and sugar feeds the bad guys, not the good guys. Load up on fresh vegies. Especially your dark green leafies. I know you’ve heard it all before, but it’s true. Fresh vegetables and fruits have all the living organisms your body needs to build a healthy immune system. Another two key factors are stress, and movement. Stress is terrible for pretty much every part of your body, including your immune system. So trying to reduce that on a daily basis goes without saying, not just as a part of your winter coat of armour. Fresh air and movement are also vital – again for so many reasons, not just immunity defences. If the sniffles hit, I have some tried and tested simple remedies. They work every time at either knocking the bug on the head before it takes hold, or reducing the severity and duration of the virus. My Mr 7 had a compromised night’s sleep last week, and was red eyed-tired the following day, with a sore throat coming on soon after, sneezes and a slight sniffle. I used these techniques below, as well as a couple of good night’s sleep and he has been fine. No missed school days, unfortunately for him, thankfully for me! Chicken broth. Without doubt it perks the patient up quickly. It’s loaded with minerals and nutrients, is easy to digest, and easy for the patient to sip. Read my previous post on bone stocks. Add in some ginger and garlic to warm the body from the inside out is also a great idea. Don’t over cook it – gently heat to preserve the enzymes your body needs. Aromatherapy oils. I started using a kids cold and flu oil blend in their rooms many, many winter’s ago and noticed an incredible change in how they not only coped with a virus, but how quickly they recovered. It helps them breath at night, so they get a better quality sleep which is vital to recovery, and it contains anti-bacterial and anti-viral components to help kill the bug off. The oil burners are electric and stay on pretty much all winter long and their rooms smell amazing, which is a nice bonus. Green juice. I don’t juice all the time, but if I’m starting to feel rundown and can feel my glands trying to fight something off as I did two weeks ago, I hit my system with a flood of green nutrients. Taken on an empty stomach before breakfast, the nutrients enter your system quickly. I use a small piece of green apple, lots of lemon, celery, kale, parsley and ginger. Between that, some bone broth and herbal teas, that’s my staple diet when I’m starting to feel rundown. Take it easy. Give your system the chance of a fair fight. Pushing on at work, home, school or whatever, will just increase your chances of getting sick. Your body is trying to defend you so it needs all your energy to do it. Rest, clear your schedule, and look after you (or the kids if they’re the patient!). What do you do to fight off colds? What do you find works the best?